‘Scuse me, Miss, can we take photo with you? "Excuse me Miss, will you take a picture with our students?" "Yes, yes of course! Come on over!" This all started out very innocently. Amando and I were at the Holy Spring Temple walking around taking photos. There was an adorable child playing with something so I waved hi. I took one step to walk away, and the child’s father said, “Scuse me, Miss, can we take photo with you?” I obliged. Then two other young men came up to me and asked me to take a picture with them. I happily obliged and flashed a peace sign. Then two of women came up and asked if I would also take a picture. “Yes, oh of course.” Amando was nowhere to be seen….he wasn’t capturing this very important moment. Oh well. I walked away a bit puzzled as to why I had been deemed special enough to be featured in photos they would take back to their city or village and show their friends and family. Amando, having already been mistaken a number of times as Indonesian wasn’t as surprised (just disappointed he hadn’t caught the moment on film), but we still both didn’t really know the “why” of it all. New best friend at Tanah Lot. Notice the professional photographer (red hat on the right) taking a photo of us. I had figured that would be the one time. Oh….how wrong I was! 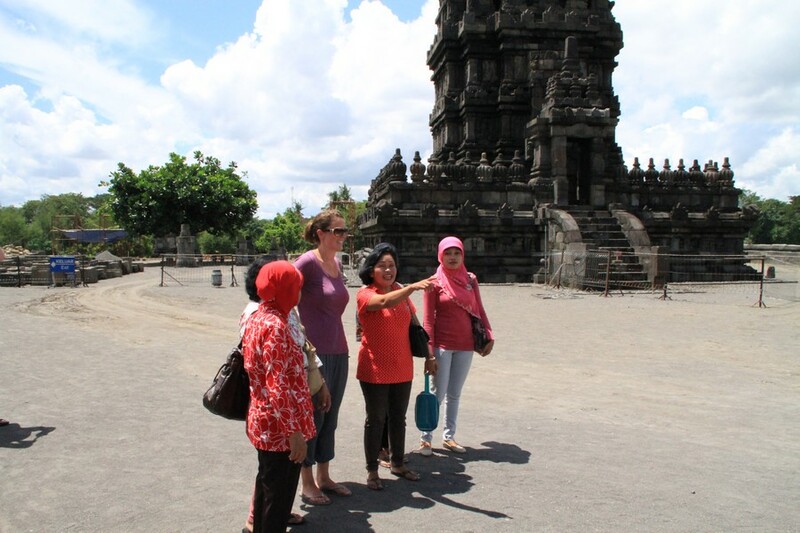 This has now happened at pretty much every major tourist site in Indonesia that we have visited. At Tanah Lot, it was a group of boys from Jakarta who wanted not only a group photo, but each wanted individual photos with me. I figured that telling them I’m American would make me less interesting. Wrong! Everyone knows and loves, “Barack Obama!” Ten minutes later, the scene repeated itself with a group of six girls, some even taking multiple snapshots because they wanted better pictures. 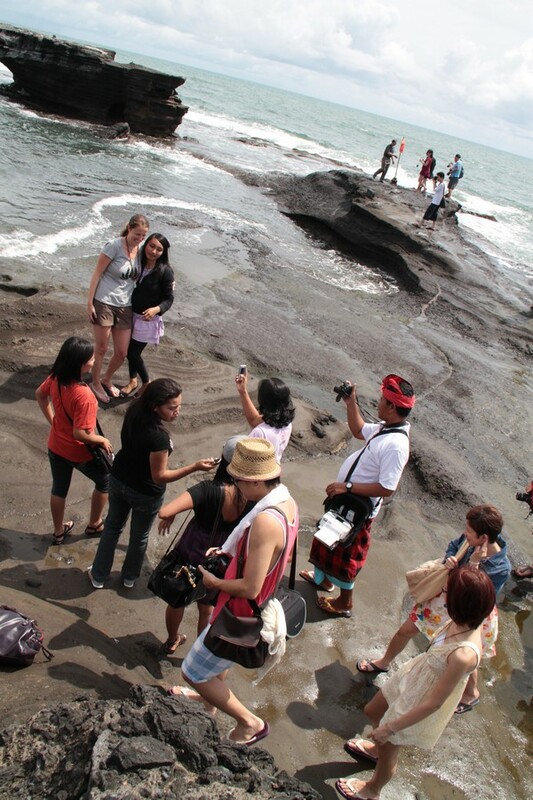 Even the official photographer at Tanah Lot, who you pay to take a picture of you, started taking pictures. 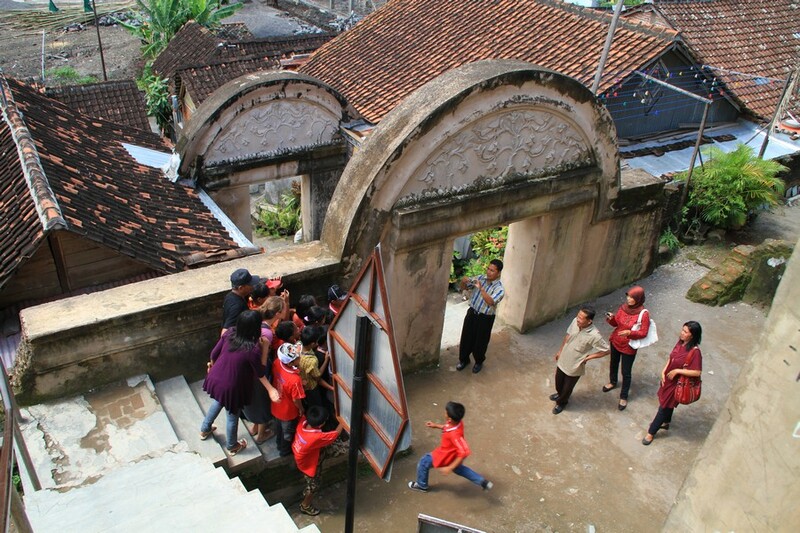 Someone walked by Amando, as he was capturing the scene, and said “you should charge $5 a picture.” If we had, our time in Indonesia might be close to free. 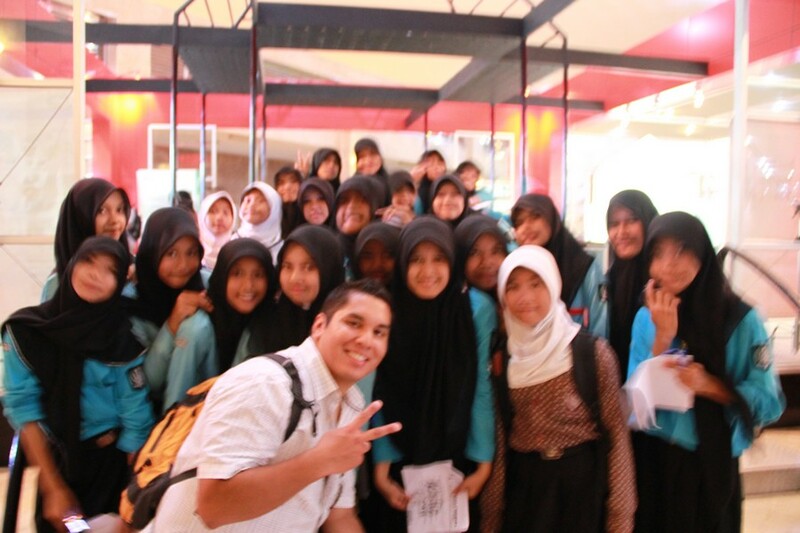 I think they were from East Java, and so nice! It has happened so much now that I can see it coming a mile away. 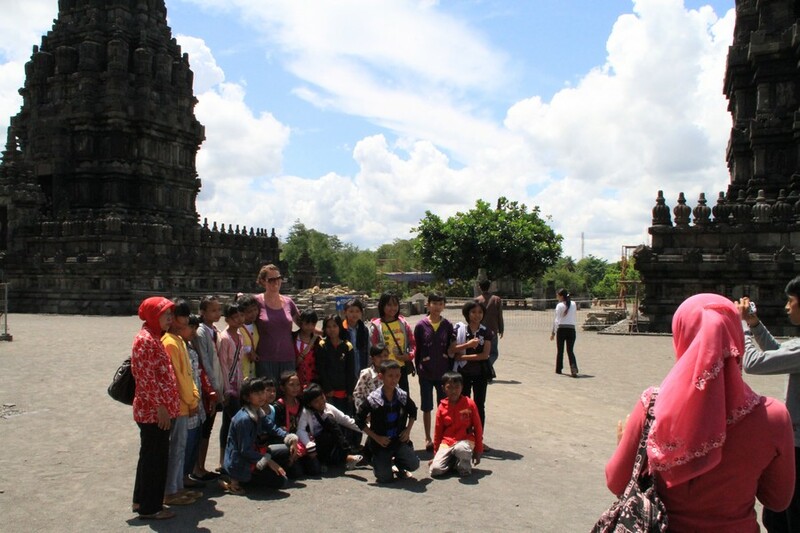 At Borobudur, I saw a group of school children walking around the temple with us. As I silently predicted, it was only a matter of time until one of the teachers said “Scuse me, Miss, can we take a picture with you?” He wanted one by himself, then one with the children, and then one with another teacher. When we ran into them later, the girls who didn’t get a photo with me asked me to stop. I happily sat with them. And for the first time, Amando’s presence in a photo was also requested (I guess they heard him speaking English). 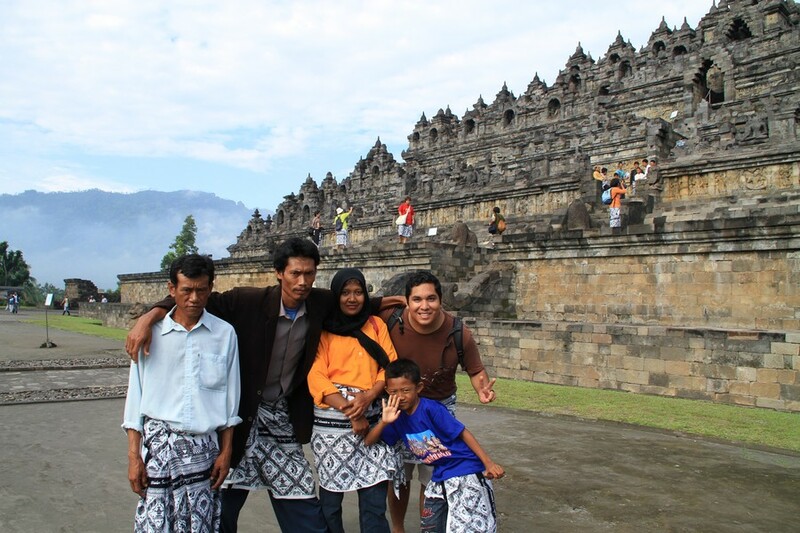 The tallest Indonesian man we’ve seen to date (maybe 6’5″) wanted a photo first with Amando and his family, and then me with his family. I swear they were happy at first. I am humbled and honored by the fact that this happens so frequently. Especially because, while I know my tourism dollars help the local economy, I can’t help but feel that the presence of my white skin is somehow changing their culture, even if ever so slowly. Being the only light skinned person around a city, sometimes for days at a time, really makes you think about the way you carry yourself and interact with others. So many sets of eyes are always following me that I don’t want to ever seem dismissive or disrespectful. So for them to want to take pictures with me, leaves me humbled and happy. Almost everyone asks our names, tells us theirs, and wonders where we’re from. It started off with just a couple. And then escalated....wait, wait for me! I have asked a couple of people why this keeps happening to me and their response has all been the same, “Perhaps they like to see you visiting their country and because you are a tourist they want a picture with you to show their friends and family.” Mr. Christian (from the Vogels Hostel) also hinted at the fact that sometimes it is just too much and its not good. I understand, sometimes it does get a bit out of hand. When we were visiting the tall monument (Monas) in Jakarta, every time Amando and I tried to leave, more people just kept asking for pictures. And one young lady was just standing in front of me the whole time as I talked to them snapping pictures of me. 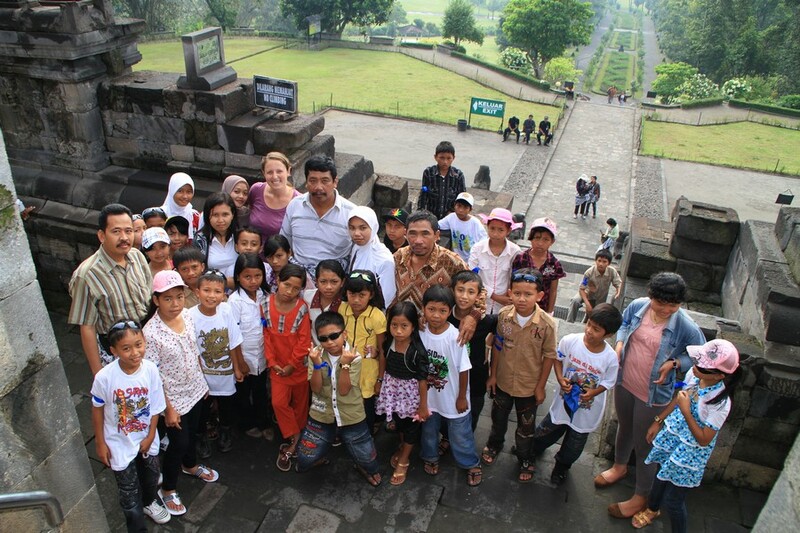 At Jakarta at the Monas, we were practically accosted, in a good way. This is the young lady who just stood in front of me and kept snapping pictures for about 5 minutes straight. Practicing their English with me. After all the time we spent together, they had to get one with my husband. Explaining engagement is just too hard sometimes. I am beyond happy to take pictures with anyone, and Amando is more than happy to be amazed by the spectacle, and occasional mob, that forms. I don’t think this will happen as much in Malaysia, Thailand, Cambodia or Vietnam, so although I liked feeling a bit extra special, I’m glad to somehow blend in a little more. Guess that means we won’t start charging….yet. But if I get my hands on facial recognition software, you can bet I’ll be searching for myself in Facebook Indonesia. **Note from Amando: If you know Erika, she’s always smiling and incredibly nice to 99.9% of everyone she meets. So to me, when she starts chatting people up, waving, saying hello, offering to take a picture of a couple together, etc…it’s not surprising that her friendly attitude makes it easier to ask for a photo with her. She was always accommodating, interested, and laughing with each interaction, being herself yet graciously trying to make the people requesting photos less uncomfortable. My thought on the subject is a bit different. 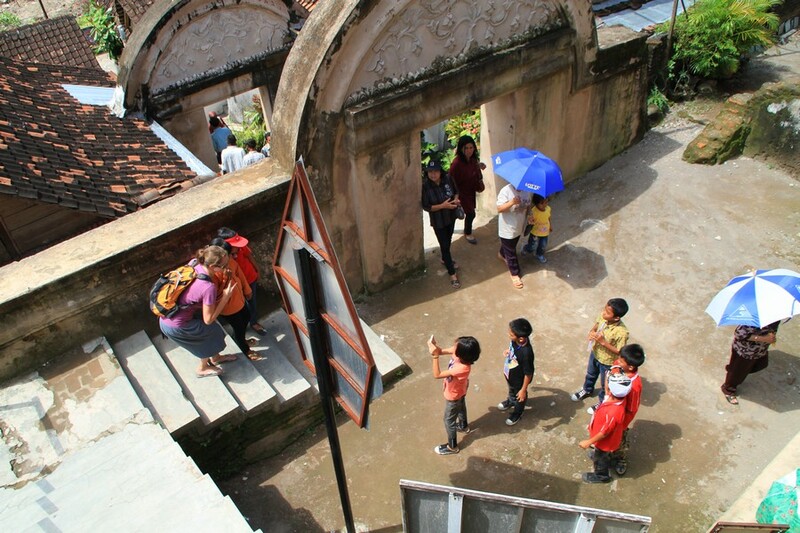 Being colonized by the Dutch for so long, there were probably those Indonesians who were “privileged” enough to have white acquaintances or friends, and those whose place in society was not as fortunate, had no opportunities to associate. As such, those today who don’t live such a privileged life can be, if just for a photo, proud to associate with and be associated with Westerners. Oh yeah and a white woman taller than most adults won’t exactly blend in anywhere here. 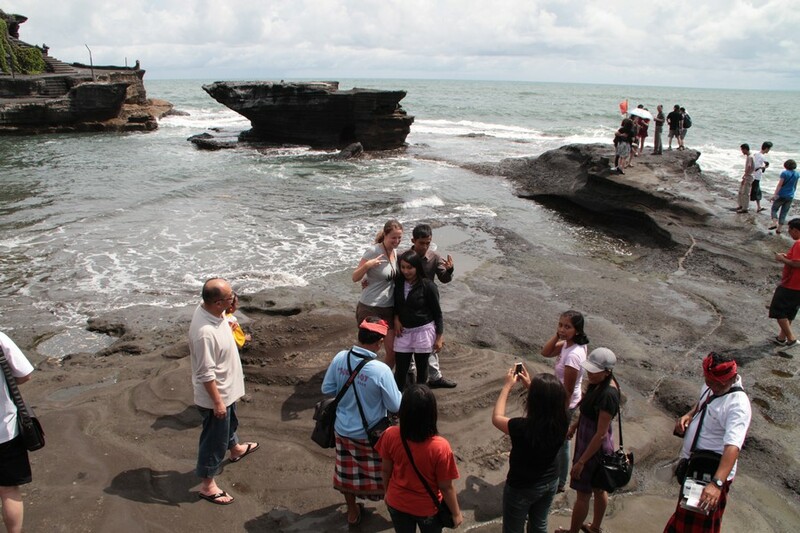 This entry was posted in Indonesia and tagged Amando, Erika, Indonesia, Pura Tanah Lot, Tanah Lot by Amerika. Bookmark the permalink. We’re charging now Sasha. That will be $5. This is awesome! It’s almost like you’re being chased by the Paparazzi. Agreed! Except much more enjoyable than what I imagine the paparazzi to be like. Awesome, I love it! I want a picture with you too! For you Amers, that will be $4.99 or one red-eye with 4 shots. BTW I’ve almost kicked coffee (almost). Sometime, ask Ella about this! She was not so tolerant…as a 3-year old! Haha, this makes me laugh. You’re going to be famous when you leave those places!